Joy Creek Photo Archive (c) all rights reserved We grow Erysimum kotschyanum in the Texture Garden where it trails over our gravel top-dressing and down the rock walls. 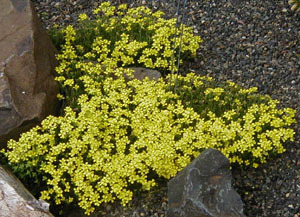 When in bloom, it is smothered in small, brilliant yellow flowers in early summer. Summer. 4 in x 8 in.